A wide range of Oriental carpets can bring us pleasure and pride of ownership as they grace our homes. Yet, only very few are also strong long-term investments worthy of collecting. With little exception, these are true antiques dating from the early 19th century to the turn of the 20th century. I term these pieces “art-level rugs.” During this period, many of the best rugs were inspired artistic expressions of pastoral nomads living in isolated encampments of Persia, the Caucasus and Turkey. Using elemental portable looms, they continually reinterpreted ancestral designs passed down from mothers to their daughters for many generations. Art-level rugs were also woven on the family looms of the cottage industry in the multitudinous villages of the Near East. In larger cities, patrons commissioned workshops to create their finest carpets, devoting as much as 15 years to a single project. Throughout the Near East, brides and grooms wove rugs to express to each other the deep affection for life that they could not formulate in words. In many cases, they would present them to one another on their wedding day. Parents wove rugs to pass on the rich symbolic heritage of their cultural group to their children. Spiritual teachers wove to communicate the deepest aspects of their teaching to their students. Especially among the tribal people, the rugs were created not as art alone; they also served a variety of utilitarian purposes, such as cushions against the desert floor, covers for their loads and door screens for their yurts. Using techniques virtually unchanged since Biblical times, the finest weavers strove to complete every step as perfectly as possible. The myriad activities involved—raising the sheep, spinning and carding the wool, brewing the dyes from pure natural sources, hand-tying hundreds of thousands, or even millions, of knots—made carpet weaving one of the most labor-intensive of art forms. But the weaving process that had existed in a virtually unaltered form since time immemorial was swiftly transformed as rugs began to be produced for export to Europe. By the 1920’s and ‘30’s, the pressure to satisfy the decorative requirements of the Western market prompted the creation of large workshops throughout the Near East. Timesaving measures were employed. The time-consuming natural dyes with their vast array of nuanced hues were replaced by easy-to-brew but harsh chemical dyes. This irrevocably compromised the level of craftsmanship, diluted the ancestral design pool and thwarted the artistic inspiration of the weavers. In little more than a generation, rug-making became an industry whose highest motivation was to produce decoratively pleasing floor coverings. Weaving was transformed from art into craft. 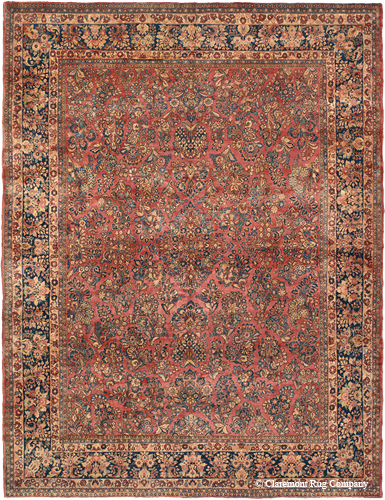 Above: Antique Persian Sarouk, 10ft 3in x 14ft 3in, late 19th century. Note that an entirely innovative design, extremely fine drawing of the motifs, purposeful, continually changing spacing of the motifs and subtle nuances of color. Signed by the noted workshop “Gazan” and inscribed for the patrons who commissioned it. 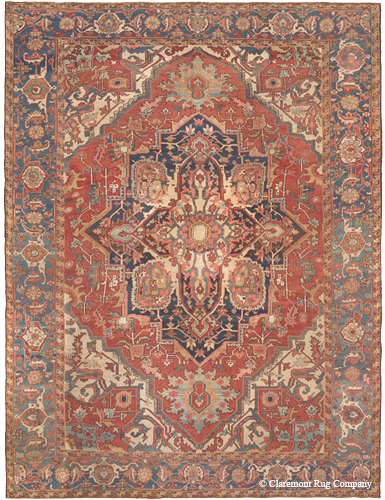 Above: Vintage Persian Sarouk, 10ft 2in x 13ft 3in, circa 1925, a first-quality carpet woven for export. Note the consistency of the pattern throughout the field and borders, the classical design of a series of bouquets and the more limited color palette. So how do I recognize an art-level Oriental rug? Regardless of the region in which it was woven, it is a unique artistic expression with an enrapturing visual impact and consummate craftsmanship.  The use of the finest quality materials is paramount. An art-level carpet offers a deeply harmonious palette of colors, stemming from the expert use of pure natural dyes, which gradually soften with age. The finest dye masters were accomplished chemists who created colors of great purity and tremendous visual depth. The presence of an array of seldom-encountered tones is a sign of exemplary artistry. For instance, a lush range of green from celadon to emerald was brewed from lengthy process of over-dyeing indigo blue wool with a yellow dye, obtained from onionskins, turmeric or saffron. Creating stunning ruby reds from the kermes beetle or regal Tyrian purple from sea snails also required a highly skilled hand. The use of first-grade wool is also of central importance. This can be seen in the magical luminosity it lends to the pile and how it greatly enhances the saturation of the dyes. The best wool is elastic and replete with natural lanolin, which one can feel to the touch. It is literally an alive material that is incredibly durable. Above: antique Persian Serapi, 3rd quarter, 19th century. 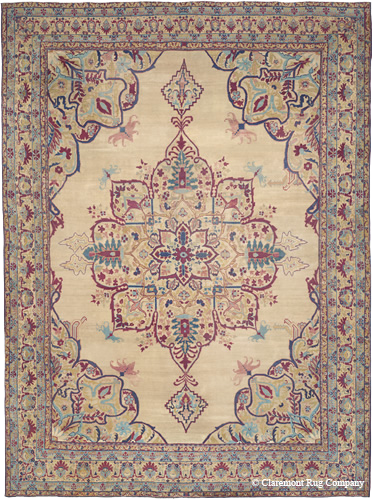 In this exclusively naturally dyed carpet, note the tremendous amount of shading and many different hues of each color. Experience how each color is at once saturated and soft. As in the natural pigments used in Old Masters paintings, the colors have a glowing, translucent quality. Above: semi-antique Heriz, circa 1950. Woven in the same locale as the Serapi eight decades later, using chemical dyes, its colors are rather harsh and entirely consistent, devoid of any nuance of hue. Many art-level rugs are brilliant explorations into the traditional pattern language of their particular tribe or region. Others demonstrate great uniqueness and rarity in their design and color. In either case, the individual stamp of its makers is abundantly present. However, the most important attribute is also the most intangible. For a rug to be considered art-level, it must possess a level of beauty that is literally breathtaking, and must emanate a profound sense of balance and harmony. An art-level rug is an impressionistic work, inspired by the glory of the sunrise, the splendor of a field of wildflowers, the strength and dignity of a mountain or the unfathomable number of stars visible on a cloudless night. It expresses the sublime rather than the mundane, perfectly capturing a timeless moment frozen in time. Above: This extremely rare, mid-19th century, oversize Laver Kirman carpet was part of a private collection for most of its life. It boasts a highly unique, vine-formed blossom medallion balanced by lush corner pieces. Inspired by the rhythm and grace experienced in the natural and celestial worlds, the great artist-weavers perfectly married color and design. Their profuse ornamentation and myriad color hues created a world overflowing with energy, yet always at peace and in unity. A number of the early Modernists of Western art were captivated by great rugs. The Cubists, notably Klee and Kandinsky, studied the abstract forms of tribal rugs in search of a new non-representational aesthetic. Matisse was enthralled by the carpets’ inventive use of color, as was Paul Gauguin who said, “Oh, you painters who ask for a technique of color—study carpets and there you will find all knowledge.” Now, a new generation of collectors is discovering what these pioneers of modern art recognized long ago, that the knowledge of combining color and design in art-level rugs is as masterful as is in any painting or sculpture. One of the great challenges for the budding enthusiast of art-level rugs is also one of their deepest lures: in most cases, masterful weavers never signed their works. An antique carpet is anonymous art. Great rugs are unaffected by pop culture trends or by the status of the artists or purchasers. 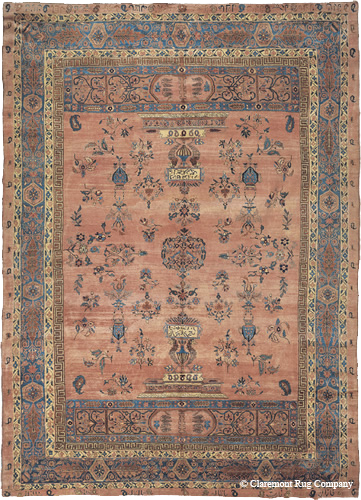 An antique rug must be judged on its own merits, on the quality of its craftsmanship and the depth of the impact it has on the seasoned viewer.